I love scrap crochet projects! How did I miss this publication that was published for Spring, 2012? I’m glad I finally got my hands on it. It’s worth the list price ($9.99) just for the afghans and scarves, but there are plenty of other projects here, from a tissue box cover to baby booties to caps, bottle covers, and hot pads – 50 projects in all. 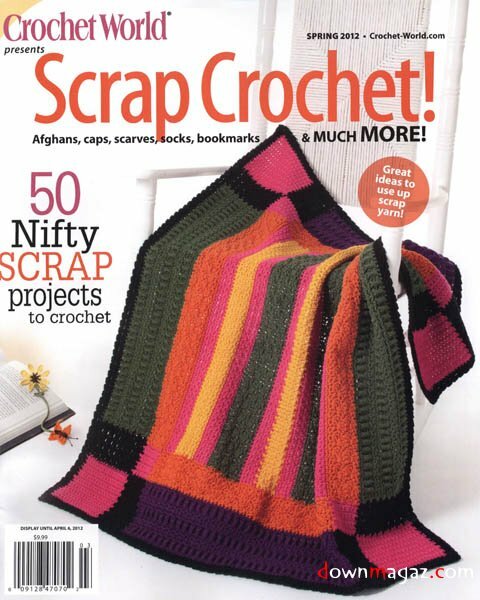 My personal favorites are the sweatshirt edging treatment on page 42, the afghan on page 96, and the shawl on page 36. Of course, all of the projects can be made without the scrappy appearance that appeals so much to me. Go stash dive, pull out your favorite partial skeins, and make something!